Berseem (Trifolium alexandrinum L.) is one of the most important leguminous forages in the Mediterranean region and in the Middle-East. Berseem is an annual, sparsely hairy, erect forage legume, 30 to 80 cm high (Hackney et al., 2007; Hannaway et al., 2004; Suttie, 1999). Berseem has a shallow taproot. Its stems are hollow, branching at the base, with alternate leaves bearing 4-5 cm long x 2-3 cm broad leaflets. Flowers are yellowish-white and form dense, elliptical clustered heads about 2 cm in diameter. The flowers must be cross-pollinated by honey bees to produce seeds. The fruit is a pod containing one single white to purplish-red seed (Smoliak et al., 2006). Berseem is a variable species that can be classified into four cultivars groups according to their branching behaviour and subsequent productivity. Highly branching and productive types are Miscawi and Kahdrawi (Hannaway et al., 2004; Suttie, 1999). Berseem is a fast growing, high quality forage that is mainly cut and fed as green chopped forage. It is often compared to alfalfa, due to its comparable feed value. However, unlike alfalfa, it has never been reported to cause bloat. It is slightly less drought-resistant but does better on high moisture and alkalinic soils. Moreover, berseem can be sown in early autumn and can thus provide feed before and during the colder months (Suttie, 1999). It is very productive when temperatures rise after winter (Hannaway et al., 2004; Suttie, 1999). The seeds are abundant under favourable conditions. Berseem can also be made into silage with oats or be fed chaffed and mixed with chopped straw (Hannaway et al., 2004; Suttie, 1999). Grazing is possible though less common than cutting. Berseem clover can also be used as green manure crop (Hannaway et al., 2004). Berseem probably originated in Syria. It was introduced into Egypt in the 6th century (Hannaway et al., 2004), into India in the 19th century and into Pakistan, South Africa, the USA and Australia in the 20th century. It is also grown in some areas of southern Europe and there are attempts to grow it in more northern areas, such as Brittany. Berseem has been one of the fastest spreading fodder species in recent times, mainly under small-scale farming conditions (Suttie, 1999). 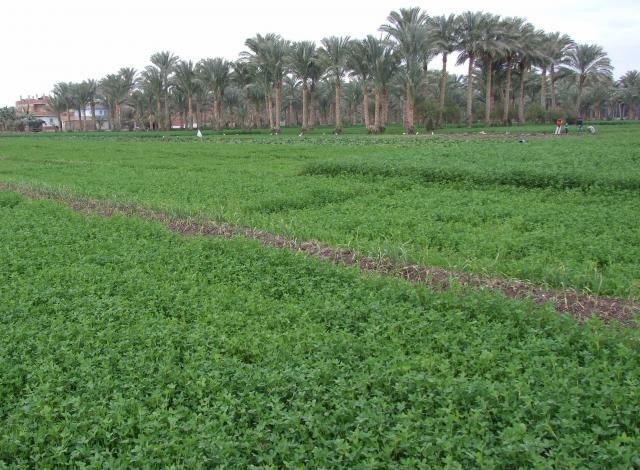 Cultivated areas reached 1.3 million ha in 2007 in Egypt (El-Nahrawy, 2011) and 1.9 million ha in India (ICAR, 2012). Morocco adopted berseem in the beginning of the 20th century and 50,000 ha were grown under irrigation in 2005 (Merabet et al., 2005). Berseem is mainly valued as a winter crop in the subtropics as it grows well in mild winter and recovers strongly after cutting. It does not grow well under hot summer conditions. It is cultivated from 35°N to the Tropics, from sea level up to 750 m (1500 m in North West Himalaya) (Hannaway et al., 2004; Suttie, 1999). Berseem has some frost tolerance, down to -6°C and as low as -15°C for some cultivars (Suttie, 1999). Berseem can grow in areas where annual rainfall ranges between 550 mm and 750 mm. It can withstand some drought and short periods of waterlogging. It does better than alfalfa in high moisture soils and is very productive under irrigation. It is moderately tolerant of salinity and can grow on a wide range of soils, though it prefers fertile, loamy to clay soils with mildly acidic to slightly alkalinic pH (6.5-8) (Hackney et al., 2007; Hannaway et al., 2004). Berseem is only propagated by seeds and is usually sown in early autumn. It can be sown on a conventional seedbed or be direct drilled. Berseem can be sown alone or in combination with other species. It is mixed with grass (ryegrass) or with a winter cereal crop such as oats to make high quality silage. Berseem can be integrated into a rice-wheat cropping system, as a winter and spring feed: it is then sown before or just after rice harvest. In Australia, berseem is sown with other legumes such as arrowleaf clover (Trifolium vesiculosum), Persian clover (Trifolium resupinatum) or balansa clover (Trifolium michelianum). In some areas, berseem is sown with vegetables such as sarson (Brassica juncea) or turnips (Suttie, 1999). Under irrigation, berseem must be sown earlier and irrigated on a weekly basis at the beginning. Ten to 15 irrigations are generally necessary for fodder production (Suttie, 1999). 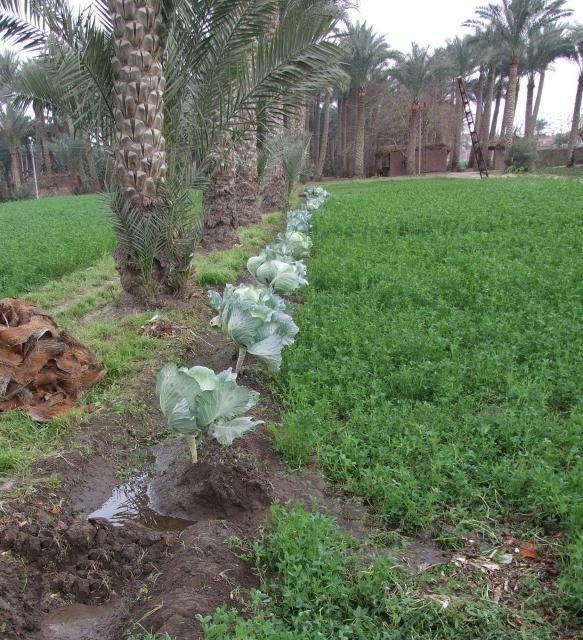 In Morocco, irrigated berseem yielded 8-10 t DM/ha (Bounejmate, 1997). Highly branching and productive types such as Miscawi and Kahdrawi can yield 4-6 cuttings/season while Saidi can be cut only twice. Fahl berseem is a low branching cultivar and is more adapted to dry areas (Hannaway et al., 2004; Suttie, 1999). Berseem should be cut when basal buds are short (about 2-4 cm high) so that they escape cutting, which would hamper regrowth and forage yield (Villax, 1963). Berseem does not perform well under grazing as livestock may damage its upper growing buds. When grazing is intended in irrigated pastures it should start before the sward becomes too erect. The sward should be grazed down to 5-6 cm high and the rest period should be about 30-40 days between grazing periods (Hackney et al., 2007). It is a high quality green forage. Berseem should be cut 50 to 60 days after planting and then every 30-40 days (Suttie, 1999). The highest yield of protein with a relatively low yield of fibre was obtained by cutting the plant at a height of about 40 cm. Five to six cuttings can be done under irrigation and one or two at the end of the cool season in dryland (Göhl, 1982). Berseem is not well suited to make hay because its succulent stems do not dry easily. When berseem is intended for hay, only the last spring cut should be used as it is drier. It may also be useful to wilt berseem in the field and then let it dry on roof tops to make it into hay (Suttie, 1999). Berseem can be mixed with 20% ground maize to provide high quality silage (Shaug SuePea et al., 2000). It is possible to make silage with berseem and 5% molasses (Gaafar et al., 2011). Berseem is an N-fixing legume. It may require rhizobium inoculation outside its native area (Hackney et al., 2007). As a winter crop it provides soil cover and prevents erosion. As a green manure, berseem intercropped with oats in a maize/soybean/oat + berseem rotation increased maize yield by 10% and returned 43 kg N/ha (Ghaffarzadeh, 1997). Berseem sown in mixture with oats or ryegrass smothers weeds during establishment, and regrows after cutting at the time the oats are harvested (Clark, 2008). Berseem is a high-quality forage characterized by a high concentration of nutrients, primarily protein (15-25% DM), minerals (11-19%) and carotene (Feedipedia, 2013; Sharma et al., 1974). Even as hay, the crude protein content of berseem can be higher than 20% DM (Sharma et al., 1974). 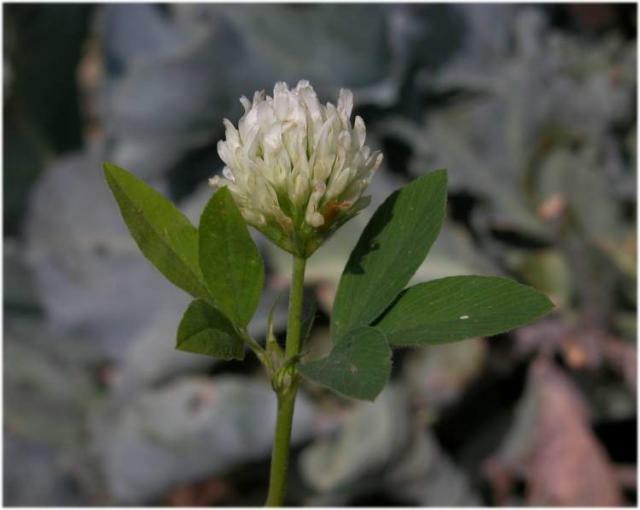 Unlike alfalfa or other forage legumes, no bloat has been reported with berseem clover (Suttie, 1999). Berseem is a very palatable and fairly digestible forage (Das et al., 1999). It is particularly valuable since it is a non-bloating forage legume (Hannaway et al., 2004). Fresh berseem has a good nutritional value very comparable to that of fresh alfalfa (Brink et al., 1988; Fraser et al., 2004; Yoelao et al., 1970). The nutritive value of berseem (protein and energy) can meet the requirements of relatively high producing dairy cows (more than 30 L/d), provided the cows consume sufficient DM to achieve this level of production (Fulkerson et al., 2007). When grazed before the oldest foliage began to senesce, the metabolizable protein content of berseem can be particularly high compared to other fresh forages (Fulkerson et al., 2007). 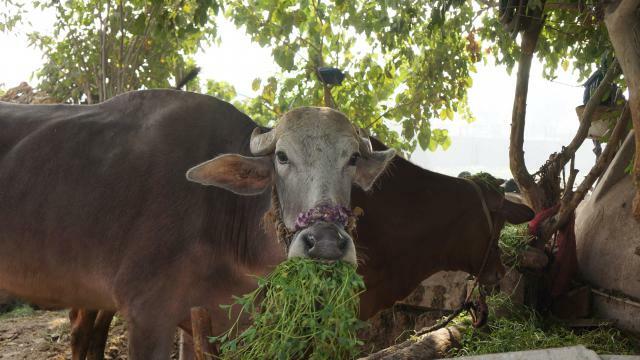 In India, the sole feeding of berseem supported a growth rate of 550 g/d in buffaloes (Chauhan et al., 1992); and in dairy cows maintenance and milk production up to 10 kg/d (Das et al., 1999). Wheat straw can be a major source of ruminant feed. Inclusion of berseem in a wheat based ration, up to 30% of the DM, increased intake and DM, OM and NDF digestibility. The 45% inclusion level was less beneficial when offered to 320 kg steers (Das et al., 1999). Berseem hay has a good nutritive value comparable to that of alfalfa hay harvested at comparable maturity (Karsli et al., 1999; Sharma et al., 1974). Organic matter digestibility (OMD) ranged from 63 to 71% in growing cows and crude protein digestibility ranged from 63 to 75% in growing goats. Dry matter intake (DMI) ranged between 2.4 and 3.0% BW for growing heifers, buffalo, sheep and goats (Sharma et al., 1974). Due to its high digestible crude protein content and OM digestibility, diets consisting exclusively of berseem hay were satisfactory for supporting moderately good gains in weight of cattle, buffalo and sheep (Sharma et al., 1974). It seems that berseem hay, like alfafay hay, can supplement maize crop residues (Karsli et al., 1999). It has been observed on wether lambs that DM intake and DM, NDF, ADF and protein digestibility clearly increased as the proportion of alfalfa or berseem clover hay mixed with maize crop residues increased from 0 to 50% (Karsli et al., 1999). Berseem hay could be an adequate supplement for maize crop residues for early winter as a stockpiled forage in Midwestern United States. The rapid rate at which its nutritive value declines during winter limits its use in late winter grazing of mid- gestation cows (Karsli et al., 1999). Harvest management in which cuts are applied at the stage of sixth internode elongation appears to be the most favourable for obtaining high yields of forage with high nutritional value in berseem grown in Mediterranean regions (Santis et al., 2004). However, protein content and in vitro DM digestibility remain relatively steady with the stage of maturity until early flowering (Ammar et al., 2010; Santis et al., 2004). It has been reported that berseem could also be used as straw, after threshing and collecting seeds. In that case, its nutritive value is lower than that reported for hays but remained higher than that reported for traditional cereal straws, with a protein content about 8.5% DM, DM digestibility about 49% and DM intake at 6.8 kg/d in Murrah buffalos of 370 kg live weight (Kaushal et al., 2006). Like other leguminous fodders, berseem has a good buffering capacity and a high moisture content that can delay a drop in pH during ensiling, resulting in deterioration of the nutritive value. For this reason, berseem is often mixed before ensiling with wheat straw and molasses (Sarwar et al., 2005). Other dry and fibrous fodders such as sugarcane bagasse can also be used (Mohsen et al., 2011b). 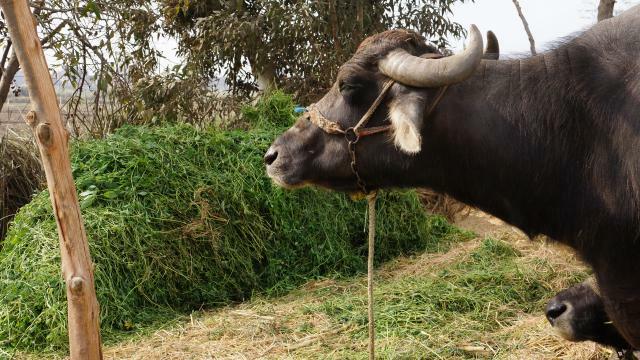 In lactating buffaloes, a diet based on 25% concentrate and 75% berseem ensiled with straw and 2% of molasses had a reduced intake compared to the same diet with fresh berseem. The effect on DM and protein digestibility was not significant (Sarwar et al., 2005). In goats, the feeding value of a berseem/bagasse (70:30) mixed silage with berseem cut during the 1st and 2nd cycle was higher than that of berseem hay cut during the 3rd and 4th cycle (Mohsen et al., 2011a; Mohsen et al., 2011b). In India, pigs were fed on berseem at up to 25% DM in the diet at low cost and with no deleterious effects on animal performance. The forage was fed with 50% kitchen waste and 25% concentrates, thus reducing the amount of concentrates by 50% (Kumar et al., 2011). Berseem forage has a similar chemical composition as alfalfa. Its energy for poultry is very low, due to its high fibre content, and it is therefore possible to use it more efficiently in low energy layer diets than in broiler diets. In layers, berseem addition in diets that contain low levels of pigment due to the use of feeds such as broken rice or cassava meal, can improve egg yolk coloration (Jadhao et al., 2000; Brahmakshatriya et al., 1975). In broiler diets berseem meal depressed performance when introduced at 2-4% of the DM, and performed less well than alfalfa (Afraz, 2005). When berseem meal was included at high rates (20-25% of diet DM), performance was affected more in young animals (1-4 weeks) than in finishers, whose performance was comparable to that obtained with the control diet (Maurya et al., 2007). Fresh green berseem, at 15% of the diet DM, improved growth and feed intake, compared to a control diet (Maurya et al., 2007). Berseem protein concentrates contain up to 60% crude protein and can partially replace fish meal or meat meal in broiler diets (Nazir et al., 1986). However total replacement of animal protein with high berseem protein concentrate levels (17.5%) led to reduced performance even with amino acid supplementation. See the Leaf protein concentrate datasheet for more general information on leaf protein concentrates. It is concluded than berseem meal has to be used with caution in poultry diets. Low levels should be used, especially in young animals. In less intensive production systems fresh berseem could be used as a protein supplement, and as a pigment supplement for layers. Berseem is usually distributed ad libitum as green forage with a concentrate given in limited quantities to young growing rabbits (Ghosh et al., 2008), or lactating does (Hedhly et al., 2011). It can also be given ad libitum as the sole feed for the maintenance of adult rabbits (Deshmukh et al., 1989). 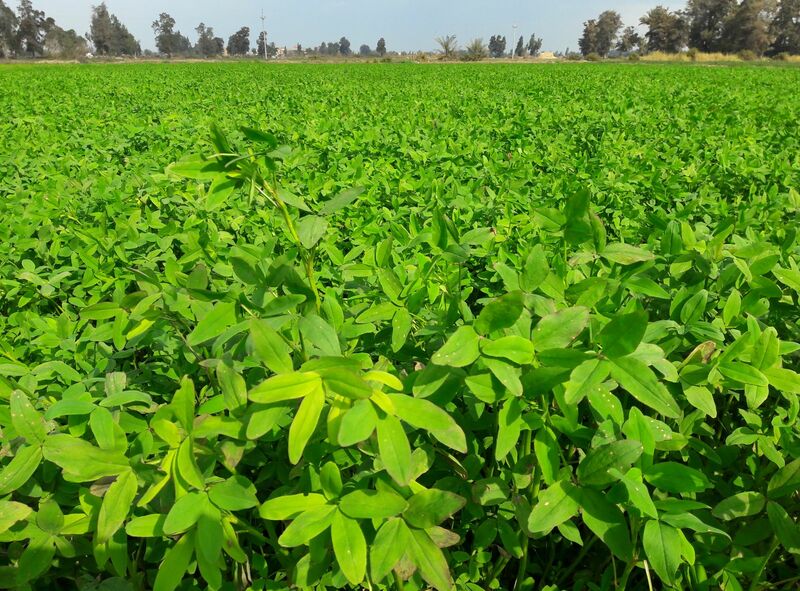 Berseem hay has a nutritive value similar to that of alfalfa hay and may completely replace this traditional forage in balanced diets (Asar et al., 2010; El-Adawy et al., 2000; Zanaty et al., 2000). Berseem hay is often a conventional or reference forage in rabbit feeding, and is generally introduced at 10-20% of the DM in commercial diets, although levels up to 45-48% DM have been used in experimental diets (Elamin et al., 2011; Asar et al., 2010; El-Gamal, 2003; Eleraky, 1996; Yamani et al., 1994; Sonbol et al., 1992; Rao et al., 1986). In a comparison of simplified diets comprised only of berseem hay and of a cereal grain, a mixture of berseem and barley (60:40) permitted a growth rate (20.8 g/day) identical to that obtained with the complete diet used as control. In the same trial a higher level of berseem hay with maize grain (70:30) was less efficient and growth rate was 30% lower (Yamani et al., 1994). When locally available, berseem straw can be used safely as a source of fibre in rabbit feeding (Ibrahim et al., 2009). Both with berseem silage and green berseem added to a concentrate diet, forage intake (20% of DM intake) and average daily gain were similar for the two modes of preservation (El-Ayouty et al., 2000). When berseem ensiled with 5% molasses in 40-50 kg plastic bags was used to replace 0, 50 or 100% of the berseem hay in a complete feed (40% of berseem hay), growth rate was significantly improved at the 100% replacement rate (29.5 g/d vs 26.3 g/d for the 0% control diet). It also increased the slaughter rate (Gaafar et al., 2011). In a comparison of the forage acceptability to horses of several grasses and clovers in the Southern USA, crimson, berseem and subterranean clovers were found to be highly palatable (McCann et al., 1991). Nile tilapia (Oreochromis niloticus) can be fed on berseem leaf meal. Fish fed 5% or 10% berseem leaf meal had higher live-weight gains than fish fed the control diet. The best protein efficiency ratio (PER) was recorded with fish fed 10% berseem meal, followed by a combination of 5% berseem meal and 5% mung bean seeds (Emil, 2001 cited by Hassanin, 2009). The highest energy utilization was recorded for the group fed 10% berseem meal in the diet, while the lowest was recorded for the group fed 5% berseem meal and 5% plus 10% mung bean seeds (Hassanin, 2009).